William Ewart was born in Liverpool. He was educated at Eton and Christ Church, Oxford, where he gained a BA. An active social reformer, Ewart was elected as Member of Parliament for Bletchingly from 1828 to 1830 after a career as a barrister. He was later elected for Liverpool (1830, 1831, 1832 & 1835). At first he concentrated on legal reform and played an important role in the abolition of capital punishment for minor offences (1837). Ewart was later elected for Wigan (1839) before becoming MP for Dumfries in 1841. He then turned his attention to working class education. Ewart joined forces with the MP for Salford, Joseph Brotherton, and the Chartist Edward Edwards to draft a Public Libraries Act. Ewart faced considerable hostility from the Conservatives in the House of Commons. It was argued that the rate paying middle and upper classes would be paying for a service that would be mainly used by the working classes. Ewart was therefore forced to make several changes to his proposed legislation before Parliament agreed to pass the measure. The Public Libraries Act became law in 1850. 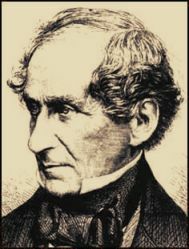 Whereas William Ewart wanted all boroughs to have the power to finance public libraries, the legislation only applied to those boroughs with populations of over 10,000. The Borough Councils also had to obtain the consent of two thirds of the local ratepayers who voted in a referendum. Other restrictions included that the rate of no more than a halfpenny in the pound could be levied. Furthermore, this money could not be used to purchase books. The bust of Ewart shown on the right may be seen in the Ewart Library in Dumfries. When Ewart retired in 1868 he had served in the House of Commons for forty years. 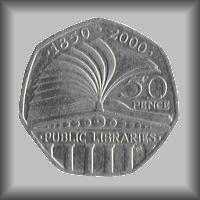 In the year 2000, to commemorate 150 years of Public Libraries in the United Kingdom, a special fifty pence coin was minted. For this commemorative coin a special reverse design was created by Mary Milner Dickens, sculptor and winner of a very limited competition. Her design captures both the present with the turning pages of a book above the pediment of a classical library building, and the future by including CDs to decorate the façade. Computer technology is indeed bringing great changes to libraries and it was intended to connect every public library in Britain to the Internet by 2002. On the obverse of this commemorative fifty pence coin appears Ian Rank-Broadley's portrait of Queen Elizabeth. Although the coin does not mention Ewart's name it is a fitting tribute to his memory and his aspirations.